Magnum Sal is a game about mining salt in 1368. No wait, don’t go! I know salt mining might not be your dream theme, but this one does it so well. So stay a while and listen, to a tale about the salt miners of yore. What is “Magnum Sal” like? In Magnum Sal each player manages a team of miners striving for the favour of the king. The favour of the king is won by mining the most and best salt. You do this by having your miners work for you in the mine shaft or go to town for various actions (two actions each turn). This is fairly straight forward modern day euro stuff, with some significant twists. The biggest and most interesting twist is how you explore and mine in the mine shaft. At the beginning of the game the mine shaft is built by placing mining tiles face down randomly making up a central shaft and three levels. When a player places a miner in the mine shaft you will turn the tile he places the miner on up revealing the amount of water and salt in that area. The miners however, must be placed by the ‘chain rule’. There must at all times be an unbroken line of workers all the way to the surface. It doesn’t have to be one of your own miners though. When you mine salt you look at how many miners you have on a mine tile and subtract the amount of water on the tile, and then you have the ‘strength’ of your workers there and that is the amount of salt you can mine. Having worked hard to mine the salt your miners become fatigued (in game you lie your miners down) and can only rested and available again after you skip your turn. To bring the salt back to the surface you use the chain of workers back to the surface, the trick is though that for each area of the chain that you don’t have any miners, you must pay one of your opponents present in that area. This brings a really interesting balancing act in the game, how far do I want to stretch my available miners? Can I lock down an opponent’s workers by putting one worker at the end of the chain and not removing it? This is where the meat of the game is. Apart from mining or taking a place/move miner action in your turn, you can also use an action on activating a building in the city for various effects such as getting equipment cards that help you in the mines, sell and buy salt to make it easier to fulfil your contracts or earn money, get rid of water down in the mine and finally you can send a miner to the castle to fulfil a contract from the king. A nice little twist here is that the game isn’t limited by a set amount of rounds, but by a finite amount of contracts, so every time you complete a contract you push the endgame closer. Another way you can utilize your miners are by making them assist in one of the buildings in the city, this gives you income whenever that place is activated. I really like this game. It captures the theme incredibly well. Everything comes together nicely. Perhaps the feeling of exploration could be a bit stronger and I really want to try out the expansion because that looks like it creates just that. This is a very clean and somewhat cut-throat euro game. This will stay in my collection and I even sold Haspelknecht off because I feel like this is a way better mining themed game. Close to a five rating. This game is fun, it is light hearted and not too heavy. It plays relatively quickly and turns go by fast so you wont be bored while waiting for your turn, and the whole sort of area control thing going on in the mines keeps you interested even in other players turns. Everything in this game makes thematic sense and evokes the feeling of exploring the mines. It is an abstraction obviously, but it makes a lot of sense. 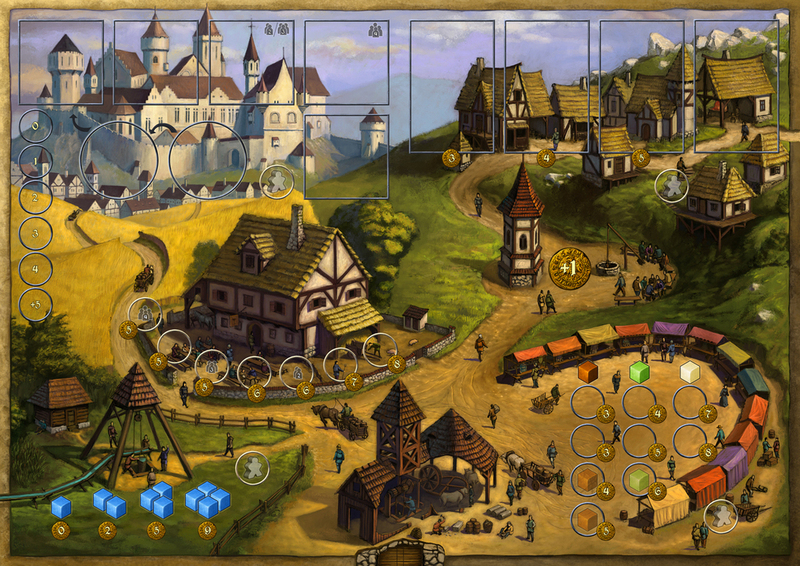 The game is a little generic euro looking, but at the same time it is very well executed. Components are great looking, but the age shows a bit (released in 2010 and the average component quality of games has risen since then) and if someone did a reprint on kickstarter there could be some really cool custom components made for this. The manual however would not need much work, it is concise and well written and leaves little to be desired. This game barely reaches a complexity level of three. However I chose to put it there because the game can feel heavy as how the mechanics work together takes a couple of games to really get the feel of. Take look at this Tom Vassel review of the game to get a deeper feel of how the game plays.